Like Old Yeller before it, The Light in the Forest is a western based on a popular book. The fictional novel of the same name was released in 1953 and was written by Conrad Richter. This would be the final Disney film for Fess Parker, who at the time was Disney's biggest star. However, it was the first of four Disney films for James McArthur. Most of the film was shot in Tennessee, but some scenes were shot in California. The film takes place in 1764 as a peace treaty is made with the chief of the Delaware indians to release all of their white captives. A young white man named True Son who was raised by the indians is reluctant to go because he feels like more of an indian than a white man. He is taken to Pensylvania where his birth parents are waiting for him. His birth name is Johnny Butler and Del Hardy, the man who was in charge of returning Johnny, is ordered to keep an eye on him. Johnny's aunt and uncle have an indentured servant named Shenandoe who's parents were killed by indians. Against the odds, Johnny and Shenandoe become friends, which turns into a relationship. Before Del leaves, he arranges for Johnny to have some land on a mountain. Johnny asks Shenandoe to marry him just as his indian cousins arrive and Johnny's uncle kills one of them. He runs back to the Delaware who go on the warpath killing settlers. Realizing that what they are doing is wrong, Johnny thwarts their efforts and leaves the tribe. When he gets back to town, he has to fight his uncle. After winning, Johnny and Shenandoe go to his mountain as the film ends. 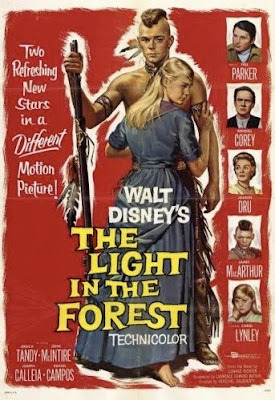 The Light in the Forest premiered on July 8th, 1958. It received mostly positive reviews from critics who praised its more serious subject matter for a Disney film and also its winning performances. Box office records for the film aren't publicly available, so I don't know if it was a success. It was never re-released theatrically, although it aired several times on TV before the advent of home video. My first experience with The Light in the Forest was actually with the book, which I had to read in middle school. After reading it, our teacher showed us this film version. Both versions are great, but the film is quite different from the book. At any rate, it's a beautiful film about prejudices and the fact that there are good and bad people everywhere. The film is well made with beautiful cinematography and great acting. It's definitely worth seeing. The Light in the Forest was released to VHS several times, most recently in 1997. While it has never been widely released on DVD, an educational version can be purchased from Disney Educational Productions for the steep price of $29.99. For this review, I used a VHS copy. Hopefully Disney will give this film a wide DVD release so that more people can experience it. Who was the film editor for the movie. A Light in the forest?